Life stage changes, diet, hair styling and overall health, can all impact the health of our hair. Maintaining a healthy head of hair begins with the proper nutritional building blocks. The hair follicle itself is a highly active metabolic "factory" requiring oxygen, energy and protein synthesis to maintain normal healthy hair. 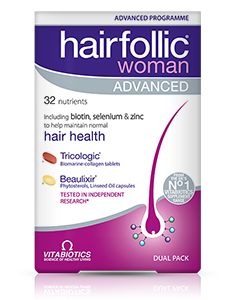 Hairfollic Woman Advanced has is a dual pack programme that has been developed to provide a full spectrum of vitamins and minerals, including scientifically researched Beaulixir® capsules. Exclusive Tricologic® Biomarine-collagen complex; with hydrolysed marine collagen, silica plus a proprietary combination of selenium and zinc which contribute to normal hair. It also contains amino acids and grape seed extract. Advanced Beaulixir®1 capsules; a complementary approach to topical products. This unique capsule contains an advanced proprietary formula including natural phytonutrients borage, saw palmetto, wheatgerm and linseed oil. The Beaulixir® formula has been scientifically shown in research to help support healthy hair density2 and growth2. Various daily routines such as hair colourants, heat styling and overzealous brushing can all take their toll on our hair. Biotin, niacin (vitamin B3), zinc and iodine can all contribute to the maintenance of normal skin. Copper helps maintain normal hair pigmentation. Hairfollic Woman Advanced also contains support for your skin and nails. The formula includes vitamin C which contributes to normal collagen formation plus niacin (vitamin B3) which contributes to the maintenance of normal skin. Zinc and selenium contribute to the maintenance of normal nails. The Hairfollic Woman formula provides a comprehensive balance of nutrients, including vitamin B6 which contributes to normal red blood cell formation and vitamin C which contributes to normal collagen formation for the normal function of skin, bones and blood vessels. An additional multivitamin is not necessary. 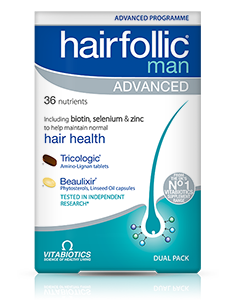 Hairfollic Woman Advanced can be ordered online here. Maltodextrin, Bulking Agent: Microcrystalline Cellulose, Hydrolysed Marine Collagen (from Fish), L-Cysteine, Pantothenic Acid (as Calcium Salt), Silicon Dioxide (Colloidal Silica), Magnesium Oxide, Myo-Inositol (Carrier: Acacia Gum), Vitamin E Natural Source (as D-Alpha Tocopheryl Acid Succinate) (from Soya), Vitamin C (Ascorbic Acid [Carriers: Hydroxypropylmethylcellulose & Tartaric Acid]), Tablet Coating (Hydroxypropylmethylcellulose, Hydroxypropylcellulose, Caprilic/Capric Triglyceride, Natural Source Colours [Titanium Dioxide, Iron Oxides]), L-Methionine, Ferrous Fumarate, Niacin (as Nicotinamide), Zinc Sulphate, Anti-Caking Agents: Stearic Acid & Magnesium Stearate, Thiamin (Vitamin B1 as Mononitrate), Betacarotene (Carriers: Starch, Water, Antioxidant: DL-Alpha Tocopherol), Vitamin B6 (Pyridoxine HCl), Vitamin D3 (Cholecalciferol [Carriers: Acacia, Sucrose, Corn Starch, Medium Chain Triglycerides, Antioxidant: DL-Alpha Tocopherol]), Riboflavin, Manganese Sulphate, Grape Seed Extract, Copper Sulphate, Folic Acid (as Pteroylmonoglutamic Acid), Sodium Selenate, Chromium Trichloride, Potassium Iodide, Biotin, Vitamin B12 (Cyanocobalamin). Allergy Advice: For allergens, see ingredients in bold. Capsule Shell: Pharmaceutical Grade Gelatin (Bovine Source) & Glycerin, Linseed Oil, Borage Oil, Wheatgerm Oil, Saw Palmetto Oil, Phytosterols (Pinus Sylvestris), Rye Extract (Secale Cereale). Allergy Advice: For allergens, see ingredients in bold. 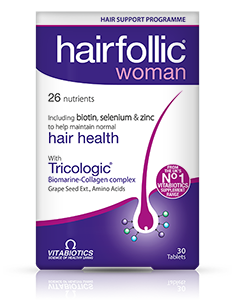 Hairfollic Woman Advanced provides 30 tablets and 30 capsules (15 days supply). As with other food supplements, consult your doctor or pharmacist before using if you are under medical supervision, pregnant, breast-feeding, have epilepsy, a thyroid condition, haemochromatosis, suffer from food allergies, or are allergic to any of the ingredients. Not suitable for children. Allergy Advice: For allergens, see ingredients in bold. Not be taken on an empty stomach. This product contains iron, which if taken in excess, may be harmful to very young children. To protect the ingredients in Hairfollic, always store as directed below. Store below 25°C in a dry place, out of sight and reach of children. Why has Hairfollic Woman Advanced been developed? 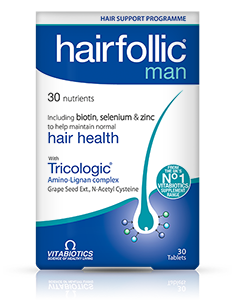 Who can use Hairfollic Woman Advanced? How and when should Hairfollic Woman Advanced be used? Can Hairfollic Woman Advanced be used simultaneously with medications? 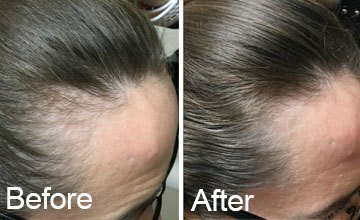 Are there any undesired effects whilst taking Hairfollic Woman Advanced? Always read the product directions before use. Do not exceed the recommended intake. As with other food supplements seek professional advice before using if you suffer from food allergies, and consult your doctor or pharmacist if you have an underlying medical condition. Vitamin supplements are not intended to treat or prevent any disease. Food supplements must not replace a balanced and varied diet, and a healthy lifestyle. This product contains iron, which if taken in excess may be harmful to very young children.